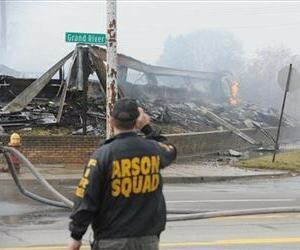 An arson investigator is responsible for determining the cause of fires, once they are extinguished, and whether or not there was foul play involved. As a detective and a fire scientist, you will be responsible for working with fire departments, police agencies, insurance companies and the criminal justice system so that legal cases are investigated and resolved. The process of becoming an investigator can vary from agency to agency. If you were to ask someone working for the Bureau of Alcohol, Tobacco, and Firearms what steps you need to take, the answer may be different from the one given if you asked a member of a fire arson team in your region. While there could be different requirements from region to region, here are the common steps that you need to take to join an arson team as an investigator. Being an investigator is not for everyone, especially not when you are working with a public or private arson team. If you truly want to see if this is the right career choice for you, you should consider volunteering before you take any type of formal training that you must pay for. When you work as a volunteer with the fire department, you will get free basic education on how fires start, evacuation techniques, and how fires are contained. Once you see that you like fire prevention and investigation, you can then enroll in a firefighter course. This is part of the recruitment process and is a requirement if you plan on pursing a specialty in the public sector. There are several routes available to complete your firefighting training. You may complete a program at a fire academy to get a certificate or earn your degree in fire science or engineering. This will replace the need for a basic vocational certificate. You may know how to prevent and suppress fires when you work as a firefighter, but that does not make you a fire investigator. To move up the ranks into investigation, you will need to complete an arson investigation program. The curriculum will focus solely on investigating, researching, analyzing and reporting fires. Some of the classes that you take will include: legal ethics, documentation techniques, effective testimony and the criminal justice process. When you choose a training program, you will need to decide what you want to specialize in so that you can take specialty coursework. Growth in the field of arson investigation, whether it be in the public or private sector, is dependent on population and the number of professionals retiring. While the demand in the field is only projected to grow by 6% with local public agencies, there is still a demand in private settings when you have professional experience. In order to work in either setting, you will need to build your credentials. Start by looking for entry-level roles and then pursue your certification through the International Association of Arson Investigators to attest to your skill. Becoming a well-trained and highly qualified professional is crucial when you work in fire investigations. If you want to help bring criminals to justice and have a passion for fire science, it is time to start along the path of studying to become an arson investigator. Related Resource: Is Criminal Justice a Strong Major for Those Interested in Investigations and Forensics?